It only takes a peek at Anthropologie to make me weak at the knees, and this season, their collection is by far one of their strongest in my opinion. I'm finding that their buyers seem to pull together collections that don't simply speak to trend, they speak to urban-minded well-traveled women who want their homes to have a classic, timeless appeal. I feel like, with Anthropologie, I'm safe. Nothing is overly trendy. I won't have to edit my space in 6 months because what I purchased looks dated. 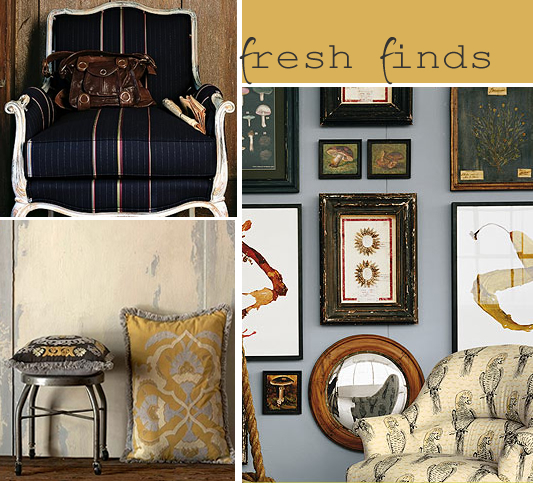 Check out all of their latest adds to their home collection here, or for a quick view of my favorites, check out my fresh finds below. I'm in love with the Turkish Chelsea rug. This would be a great add for a living room to really ground your space against hardwood floors. The clear edison lamp is a sleek find, and the divine cup and saucer set is charming (I love taking tea with clear hobnail mugs). If it's bold you're after, these red color wheel mugs from Japan won't leave you hungry for hue. Dove-grey jacquard sets the mood to dine in style with the ghost flower napkins (matching placemats also available). Serve up your sweets on the curio plates in black and white, or display them on colorful walls for style that stands out. I love this red antique inspired kitchen scale. When not in use for weighing, it can double as your fruit bowl by adding 12 of your brightest lemons or limes! This is a creepy cutie poison tree shelf for your walls, something straight out of an Edward Gorey illustration. 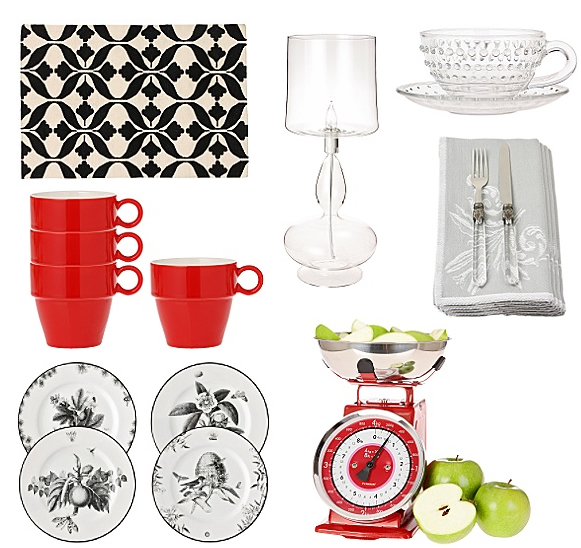 More stylish table settings to add to your shopping list, the slender leaf plates. The black bachelard chair reminds me of days spent in times past in a cafe on the left bank, agree? Black and white pendant love can be yours in a sweet graphic floral motif just by adding the garden gate, or if reversed the inside out light. I personally love the graphic circles light, imaging it above a white saarien table (or any white table with a sculptural base). Feel like sprucing up your bedroom? 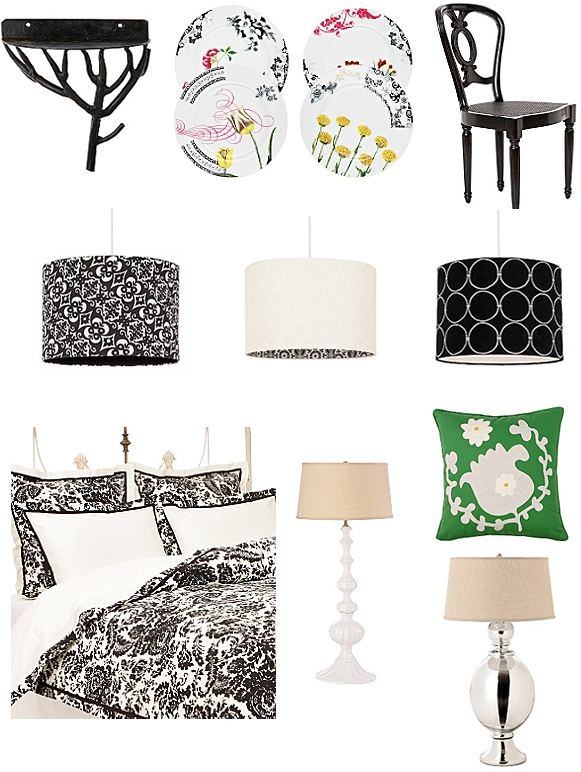 Try bringing the black and white motif into your sleeping quarters with the india ink bedding. Can't you imagine it with sunshine yellow walls? The laveau and the quicksilver lamps are lovely finds, aren't they? The laveau is also available as a floor lamp, too. Drool. Finally, add some folklore charm to your flat with the gorgeous green tulipam suzani pillow (also available in black). Ah, Anthropologie. What a delight. I'm sure you've spotted several things that you're feeling lusty for. What are some of your favorites? p.s. Don't you simply love the Antwerp chair in Paul Smith pinstripes? Don't miss all of the decorative wall decor... Looks like mushrooms are popping up as the next trend!